A new actual material (for the last 10 years) on the flora of vascular plants, received in the time of summer 2017 year expedition to North-East of Bolshezemelskaya tundra is presented. Total number of the species registrated is 97; the genera – 74, the families – 34. New localities for a number of species were identified (Caltha arctica R.Br., Ranunculus pedatifidus var. affinis (R. Br.) L.D. Benson, R. reptans L.), including those included in regional red books (16 species). 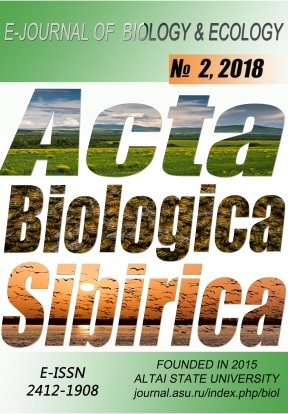 Three new species are presented for the region (Viola epipsiloides Löve et D. Löve, Galium densiflorum Ledeb., Artemisia norvegica Fries). In the regional lists of protected plants, it is proposed to include two more species, – Ranunculus pedatifidus var. affinis (R. Br.) L.D. Benson and Caltha arctica R.Br. Elkordy A.M., Schanzer I.A. (2015). Fruit morphology in Galium section Platygalium (Rubiaceae) and its potential taxonomic significance. Turczaninowia, 18, 1, 82-89. Kuliyev A.N., Morozov V.V. (1988). Floristic findings in the East Bolshezemelskaya tundra and in the Polar Urals.